Successfully Added Ultrasonic Distance Area & Volume Laser Measurement Device to your Shopping Cart. Great new tool for engineers and interior designing specialists. This Ultrasonic Distance and Area Laser Measuring Device is excellent for taking accurate measurements and extremely easy to use. It also can switch between metric and imperial measurement. How do you use it? 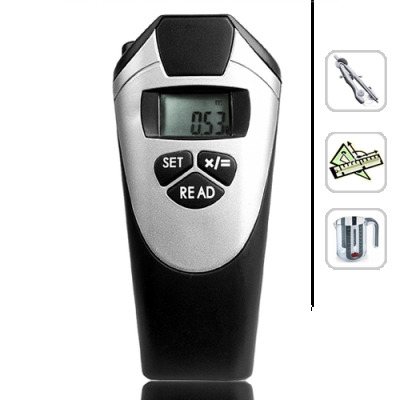 Simply find the distance you want to measure with the laser and then press the read button. Ultrasound waves are immediately deployed to precisely measure the distance and the results are shown on the LED display. Simple as that! What's more, by taking distance measurements for length and width, the unit will easily calculate Area for you. It's just as easy to figure out Volume, with three distance measurements equating to length, width, and height! Note: This great new product is available with factory direct low china wholesale price. So get your sample orders in now to experience this great product for yourself! As always, it is in stock in our warehouse and is available for immediate shipment. Click "add to cart" to order yours today. You are right: "A factory-direct price, is a bargain you should not pass up!". And it`s real pleasure to do business with Chinavasion. As Topography Engineer I`m pleased of this item - it make a good impression on my customers, if I have to measure flats (apartments) or small houses.